Most everyone has either had a rodent issue at their home / business or knows someone who has. Rodenticides (commonly called mouse bait or rat bait) are readily available at most hardware, variety and grocery stores. Here at Animal Emergency of Gainesville we see several accidental pet ingestions a month and have experience in treating this type of pet emergency. One important thing to remember is that these products are bait and they will attract more than just mice and rats. The local rodent isn’t on a stroll about the premises and just randomly bumps into these packages that are placed behind the refrigerator, under a cabinet or out in the garage or storage shed. The rodents seek them out as they have attractants in them to draw the target species to the area so that they will sample the bait and therefore ingest the poison. Your personal pets will seek these out as well and readily eat them if they find them. 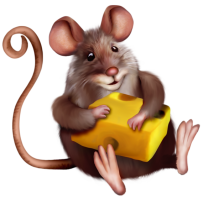 The poisons incorporated into the bait are not selective for rats or mice and will hurt your pet if ingested and no treatment is performed. The most common form of ‘poison’ in these baits are compounds that interfere with the normal blood clotting mechanism in blood. The active ingredients have the suffix “-one” or “-coum” at the end of the compound name stated in the active ingredient section on the label. Fortunately there is an antidote and its name is Vitamin K-1. This is not the OTC Vitamin K you see on the shelf in the vitamin section of your favorite store or pharmacy. The diagnosis is made either by observing the animal eating the bait or with a special diagnostic test that determines if the blood clotting is abnormal. In either case the veterinarian can help your pet get better with antidote. In severe cases a plasma transfusion may be necessary to immediately restore the blood clotting ability to the patient and therefore promote a cure. Other poisons used in rodent baits are bromethalin and cholecalciferol (Vitamin D). Bromethalin is a central nervous system toxin that causes fluid to accumulate in the brain and nerves and there is no antidote. This bait has a high mortality rate but the pet can be saved if treated aggressively over several days. Cholecalciferol causes excess calcium to accumulate in tissues especially the kidney and the rodent dies from acute kidney failure. With any of these baits, emergency veterinary attention is imperative if the ingestion is detected by the owner of the pet. It is not a good choice to wait and see what happens if your pet is known to have ingested any kind of a mouse and rat bait.